Technology is sweeping through the retail sector. As retailers are looking to machine learning, video analytics, and big data for growth, NEXCOM will present an integrated solution for smart retail at the Integrated Systems Europe (ISE) 2018. Simulating retail scenarios, NEXCOM’s smart retail solution will demonstrate how retailers can capture visitors’ attention, make personalized offers, drive customer conversion, push incremental sales, and acquire customer data for business growth. At the NEXCOM booth, "Storefront Signage", "Smart Self-Ordering Kiosk", "Smart Shelf", "Self-Checkout", "Queue Signage", and "Dashboard" are six must-see highlights. These demonstrations, featuring NEXCOM’s total solution based on 6th generation Intel® Core™ i3-6100U processor, will showcase outstanding computing and media processing capabilities and deliver amazing visuals, viewer demographic analysis, and accurate object detection results for innovative, inspiring in-store experiences. 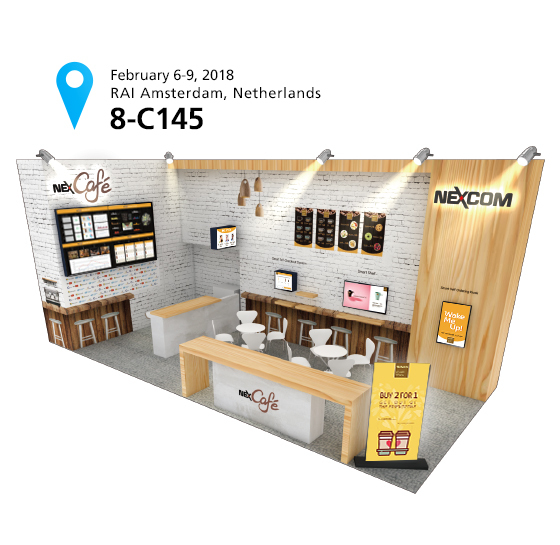 Visit NEXCOM in the Hall 8, Booth 8-C145 at ISE 2018!